Certificate as awarded to Renga-Tei following this nomination. I've spent more time thinking about this nomination than I probably should have, and I've decided to submit it for your consideration. Of all the great restaurants that I have been introduced to by the LTHForum community, Renga-Tei has been the most successful in becoming part of my routine. I find myself returning there time and time again, eagerly anticipating what awaits me on the special whiteboards inside the front door. It's Japanese comfort food. Nothing fancy. Just plain good. To me, Renga-Tei is just like a neighborhood corner diner, except this neighborhood and corner are Japanese. There's a casual, everyday, family environment about the place that makes you feel at home. 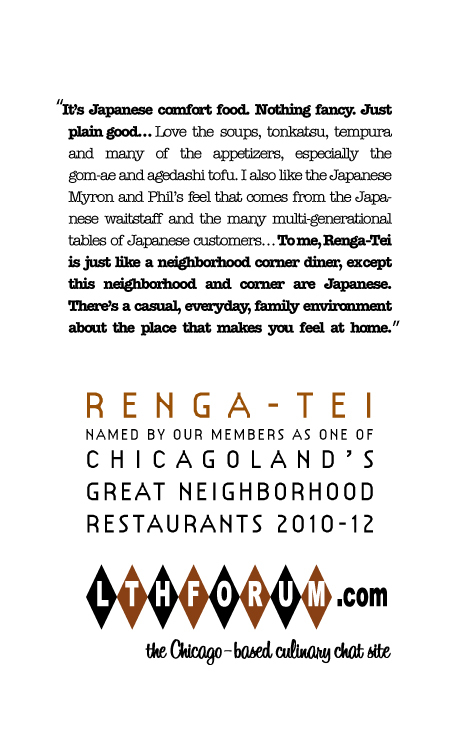 Renga-Tei works for a table full of native Japanese just as well as it does for a table full of sushi virgins. I've ordered a good portion of their offerings and I'm always delighted by the taste, quality, and the variety. My most recent visit included some standard choices (gom-ae, agedashi tofu, assorted nigiri) but also included a couple special items that were excellent: deep fried horse mackerel and blue crab miso soup (I wish I had my camera for the whole blue crab perched atop my bowl of miso). I'm also fond of the waitstaff at Renga-Tei, particularly the older women on the crew. They take to me with the kind of fondness that I'd expect from my aunt. They just love it when I order some of the more obscure or challenging items. I'm that cute little gaijin who knows exactly what hamachi kama is and isn't sure how to use the multiple different spoons served with the katsu curry. Renga-Tei is mentioned and recommended in other threads, but these two threads are the bulk of the discussion. Nomination seconded heartily, in no small measure because Renga-Tei is such a neighborhood kind of place. I love having lunch there and seeing a bunch of 60-something Japanese-American ladies decked out in their favorite jewelry having a girls'-day-out lunch. I love that they serve the best goma ae that I've ever eaten. And that the food is well prepared and well presented, but lacking in fussiness [which I think adds to the homey diner-ness of the place]. And I love that I never would have tried the place if it hadn't been for LTHforum, and now it's one of my favorite places to go! beats fancier takkatsu, etc. in a big way. in accordance with giovanna, seeing the sansei japanese diners definitely makes every meal more flavorful. Count me in for a big LTH Thumbs up for Renga-Tei as well. Love the soups, tonkatsu, tempura and many of the appetizers, especially the gom-ae and agedashi tofu. Sushi, sashimi a cut above most, though reasonably priced, and a rotating white-board of interesting and tasty specials. I also like the Japanese Myron and Phil's feel that comes from the Japanese wait-staff and the many multi-generational tables of Japanese customers. Trix & I tried Renga-Tei for the first time a few days ago solely on your nomination. The thing I love most about this place is its casual but warm staff. The room, too, is simple and inviting. For me, the single most important element to the Japanese experience is the feeling that you're being hosted in someone's home. We received a friendly greeting upon our entry and that warmth was continued on by every employee from start to finish. Although I wasn't blown away by their sushi or other cooked selections we had (assorted tempura and teriyaki plates), it was decent enough, certainly for its cost. I would enthusiastically try this place again just on its warmth of staff alone. I'm pretty sure that we would have eventually gotten around to trying out Renga-Tei at some point. But because it was a GNR selection, we made it happen sooner rather than later. For this particular reason alone, I feel the GNR program has its merits. We had dinner at Renga-Tei for the umpteenth time last Friday night. As others have pointed out, the warmth of the staff is one of the best things about the place, although the food is pretty good, too. I had a nice assortment of sushi and some rolls, which I enjoyed and The Chow Poodle had her usual order of Goama-ae and shrimp and vegtable tempura. When she commented that the tempura didn't have its usual assortment of veggies (missing the green beans), our waitress brought out a plate full of around 8 tempura green beans to make up for the oversight. I love this place and support its nomination. Not a huge list, but evidence of continuing interest in Renga-Tei from multiple directions, including the discovery of a couple of previously unknown menu items. I think this is what the record for a restaurant that has been largely explored should look like after two years, though feel free to disagree. Count me a Renga-Tei fan. It's a once every month or two lunch and the occasional dinner with my bride. Consistently fresh, terrific prepared foods as well as sushi. A hearty endorsement of Renga-Tei's GNR renewal. Renga-Tei remains one of my favorite places for sushi and homey Japanese food in the city. The Chow Poodle and I frequently go for a quick mid-week dinner. This place has always been consistent and deserves to remain on the GNR list. Grateful that my GNR administrative duties were done for the day, I indulged in my own one-two punch: lunch at Renga-Tei before heading up Touhy to Meineke's for a preparatory scratch of my itchy green thumb. Admittedly, lunch is not cheap - a bento box and a coke ran me just under $20 with a tip - but it was a LOT of good, comforting homey food. As I was eating, I was struck by the cross-cultural idea of a diner - the foods at Renga-Tei are definitely homey, you just have to alter your perception a bit. Salad in the bento is kind of a Japanese version of a greek diner salad, with a vegetable-based dressing with a horseradishy bite, iceberg lettuce, radishes and carrots. Mustardy potato salad would have been right at home next to a corned beef sandwich, and the pickled napa seemed like a close, rather than distant relative of sauerkraut. The salmon steak was nicely cooked, sauced generously (but, thank goodness, not with a sick-sweet sauce.) All were delicous and comforting. The second thing that struck me was the quality of the ordinary accompaniments. The Miso soup, often an afterthought, is a very rich and satisfying broth. I love this article from Just Hungry, and I was thinking of it as I finished my meal with plain white rice - there is something special about the plain things, here; I really enjoyed every bit of that small bowl of rice, so much more flavorful even though it was completely unadorned. Renga-Tei is one of our favorite restaurants, and continues to be so. Thumbs up for renewal. Renga-Tei allows me my favorite type of Japanese cuisine - cooked, small plates. From fried shrimp heads to yellowtail collar, from udon and yaki onigiri to katsu curry specials, all the tastes and flavors I came to love in Japan are on display here. When I head to Renga-Tei to rub shoulders with nisei and sansei diners and enjoy this style of Japanese cooking, I never leave less than warm, nostalgic and satisfied. This restaurant has my support for GNR renewal. I enthusiastically support renewal for Renga-Tei for all the reasons others have given. And don't forget to try the coffee jello! I also support renewal for Renga-Tei. I love this place and have had consistently wonderful meals here. Both the sushi and kitchen-prepared food at Renga-Tei make it a destination, in my book. We do not visit as often as we should but count us both big fans of this homey, comforting and comfortable, spot. It's like going home to mom (if your mom is Japanese) and sharing her food with lots of good friends. Everything is consistently excellent and my greatest regret is that we simply don't get there more often. We support renewal. ronnie_suburban wrote: Both the sushi and kitchen-prepared food at Renga-Tei make it a destination, in my book. Even though Renga-Tei is but a short drive for me, I'd agree its destination worthy.